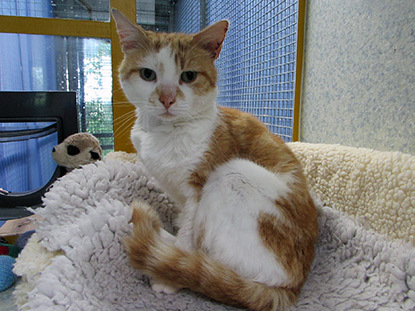 Staff at Cats Protection’s Exeter Axhayes Adoption Centre are delighted by the public’s response to an appeal for help to give a cat a much-needed operation. 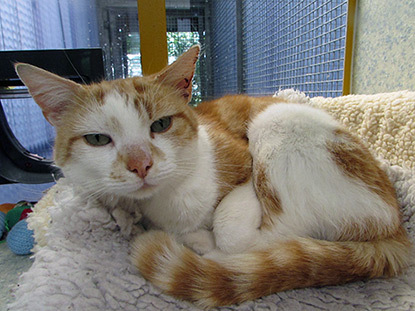 Eight-year-old moggy Alan was brought to the centre when his elderly owner moved into a nursing home. Staff at the centre could see that Alan had a very infected ear, which started haemorrhaging upon examination. Further tests by a vet revealed Alan needed a life-saving surgical TECA operation (Total Ear Canal Ablation). “The total cost of Alan’s operation is £550,” says Phil Punnett, Deputy Manager at Exeter Axhayes Adoption Centre. “It is a vital operation for Alan and, although it will leave him deaf in one ear, he will otherwise be able to lead a normal life as he looks for a new home. Phil started an appeal on JustGiving and promoted it on the centre’s Facebook page. “We received over £300 within 24 hours which is just amazing,” says Phil. “We are now just over £700! We are just delighted. The extra money raised will of course go to other cats and kittens that need our care”. Alan’s operation took place on 16 June and was a big success. Once Alan is over his operation he will be available for rehoming.